Niagara Falls, NY - Library Clerk Corby Fleischer accepts donated food from patron Pamela A. Ventry who is participating in the "Food for Fines" program, part of the #GivingTuesday Campaign. The campaign is aimed to eliminate fines and bring lapsed patrons back into the library. NIAGARA FALLS, N.Y. – The Niagara Falls Public Library has caught the holiday spirit, and is offering a fine forgiveness program to benefit Community Missions. Main Library (1425 Main Street) or the LaSalle Library (8728 Buffalo Avenue), with all donations benefiting Community Missions’ Food Pantry. 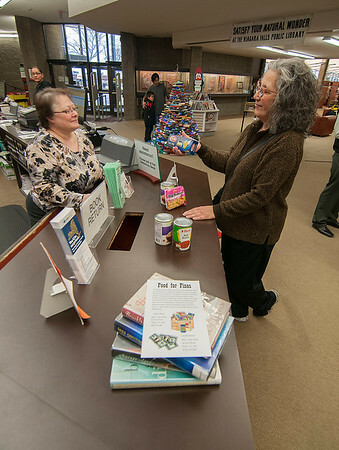 For each food item donated, library patrons will reduce their fines by $1.00, up to a limit of $20.00. The Library and Community Missions have also partnered for the past 20+ years on the Tidings of Joy program, allowing community members the opportunity to select and purchase gifts for children involved with the Mission’s Youth programs. Trees with wish list items can now be found at the Niagara Falls’ two libraries, along with the North Tonawanda and Lockport locations. In 2014, Community Missions’ Food Pantry provided more than 29,000 meals to local residents. This year, demand within the pantry has risen dramatically, with the program showing a 30% increase over last year’s numbers.